endowed with supernatural powers and therefore has to be properly rendered. The Buddha is believed to have 32 major characteristics (and more minor ones). Long en slender fingers and toes (often with the four fingers of both hands and the five toes of each foot of the same lenght). Sometimes webbed toes and fingers. Phra Phuttha Chinnarat at Wat Phra Sri Rattana Mahathat in Phitsanulok. 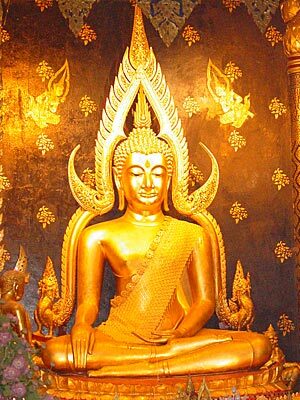 This Buddha image is generally regarded to be the 'second most' important Buddha image in Thailand. A replica of Phra Phuttha Chinnarat is present as the main Buddha image at Wat Benchamabophit in Bangkok. Standing Buddha image with the Gesture of Calming the Ocean. Walking Buddha, with the gesture of Imparting Fearlessness. The 'walking' Buddha is an innovation in presenting the Buddha, originating during the Sukhothai era. From Wat Ratchathani, Sukhothai province. Reclining Buddha (at Phra Pathom Chedi, Nakhon Pathom).